Have you seen a film or performance at Doris Duke Theatre lately? Chances are Sarah Fang had a hand in getting it on our stage or screen. Fang has been involved with the theatre (and thus the museum) since 2013, when she was hired as a part-time theatre projectionist. She was then a box office attendant and most recently been the Doris Duke Theatre program coordinator for about two years. While she’s always loved film, Fang never thought to pursue it as a career path. Instead, while at the University of Southern California, she studied international relations and studied abroad in Jordan and Beijing. When asked about her favorite piece in the museum, she heads straight to the Chinese Art galleries. 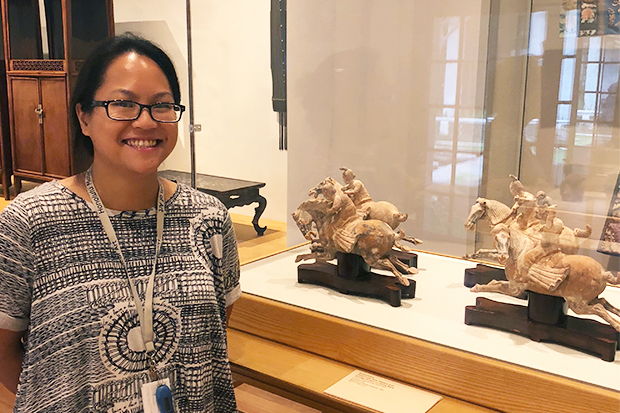 She stops in front of a glass case showcasing four small statues called Three Lady Polo Players and Foreign Groom on Horse Back. Thanks, a reminder for me to visit your fav in gallery, I love Tang horses, too!